KHOTANG, March 17: Samjhana Rai of Indrenipokhari-3 was born without hands. As a result, she used her legs for several works including writing. On Thursday, Rai was among one of the thousands of students to appear for the Secondary Education Examinations. 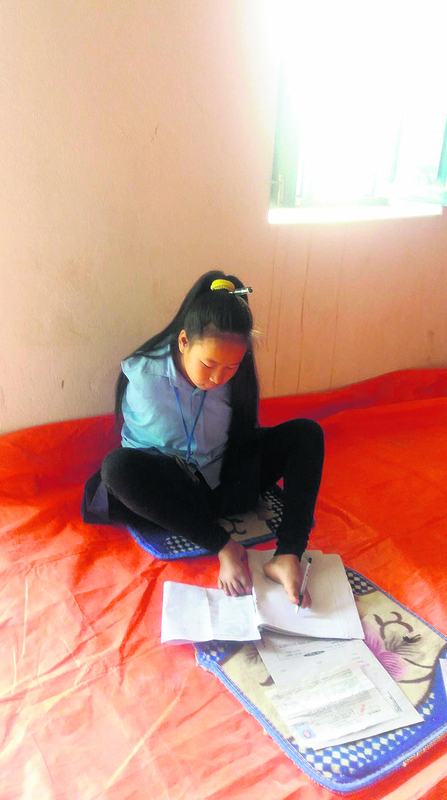 The difference was that the 17-year-old of Bhagawati Higher Secondary School, Khotang bazar was writing with her legs. In lack of disable-friendly room, Rai was seated at the floor of the office room of Simpani Secondary School. According to Santosh Dhakal, a teacher of Rai's school, there was arrangement of special furniture for her in her school. However, in the SEE center, such facility was lacking. “That's why she had to sit like that, in the floor,” he said. “There should have been disable-friendly structures in every school,” he added. As a child, Rai was very active and bright though she had no hands. Mal Bahadur Rai and Sumita Rai of Indrenipokhari-3 said that they admitted their second child to the school after seeing her zeal and enthusiasm in learning and every other activity as a normal child. According to Dhakal, since she covers almost every work with her legs, she does not look weaker than other normal student in any aspect. “Be it household work or academic, she does everything perfectly in her own way,” Dhakal said. Rai's handwriting is impressive. She uses both her legs to turn pages and writes down with left leg. She uses legs for cooking, cutting vegetables, eating, drinking and all other household works. She can also use mobile and wash clothes. “Let that alone, she even cuts grass, brings fodder. It's amazing,” Dhakal narrated. According to Rai's mother Sumita, having a daughter like her is a matter of pride. “She has bagged many prizes and certificates. She receives certificates by holding it by chin,” Sumita said.